Frank Ezinga studied organ, piano and music theory under Jaap Zwart in The Netherlands. He followed additional classes with Anton Pauw. At age 13 Frank accompanied the worship services in the Gereformeerde Kerk (Reformed Church) in Baarn, The Netherlands, where his appointment as organist was made official in 1992. He also was the director of the church choir of Baarn-Soest. Frank was the director of the Stichts Zangkoor of Utrecht, from 1996 until his move to Canada in 1998. In The Netherlands Frank was involved with changes regarding a new hymn book and the liturgy and the roll-out in the churches. 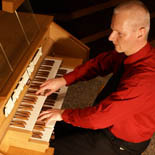 Since his move to Canada, Frank is organist of the Canadian Reformed Church at Langley, BC. Frank continued his music studies in Canada with Mrs. Mary McTier (Langley) and Terry Fullerton of St. Johns Shaugnessy (Vancouver). He particiapted in Organ Master Classes by Piet van der Steen (Netherlands), Naji Hakim (France), Pierre Pincemaille (Paris), Marc D’Anjou (Québec), Rachel Laurin (Montréal), Jonathan Oldengarm (Montréal) and a Choral Master Class by John Tuttle (Toronto). A few times a year Frank performs in solo recitals, and he participates in RCCO events when possible, to promote the organ, organ music, and people that like to play the organ. Frank was instrumental in the design and installation of the Casavant Freres pipe organ in the Canadian Reformed church at Langley in 2008. Since its installation Frank organizes musical events, of which the annual Christmas Concert by the VSO Brass Quintet with organist Terry Fullerton is one. In 2007 Frank recorded and produced a CD with the new Hymns that were introduced in the Canadian Reformed Churches. He played also an organ solo CD with hymns that is produced under the Crescendo Records Label (9056). In 2009, 500 years after the birth of the Reformer John Calvin, he released a CD with singing of Genevan Psalms. Frank was a technical music advisor to the Standing Committee of the Book of Praise (Canadian Reformed Churches) to assist the committee in the publication of a new song book for the churches (final edition was released in 2014). For the Hymns of the provisional version as well as the final version Frank has written an accompaniment book. In 2016 he followed up with a publication of 12 hymns written in two keys. In the Quincentennial Reformation Year 2017 frank organized four concerts featuring the 16th century Church Reformation in music. Frank has an YouTube channel and is active on Facebook. As a member of the Nederlandse Organisten Vereniging (NOV) and the Vereniging van Gereformeerde Kerkorganisten (VGK), Frank was involved in church music and liturgy and he participated in workshops and seminars. Frank is currently member of the American Guild of Organists (AGO) and the Royal Canadian College of Organists (RCCO) and he is Vice President of the Vancouver Centre of the RCCO. In 2001 he successfully completed the Colleague examination of the RCCO. Since 2004 Frank is the musical director of the Fraser Valley Choir “Laudate!”. The repertoire of this choir is primarily classical music. Singers increase their singing skills and gain more knowledge about music while enjoying learning and performing choral music. The choir participated in a choral workshop under the direction of John Tuttle. In 2007 the choir performed Stainer’s Crucifixion in Kerrisdale Presbyterian Church in Vancouver BC as well as in the Emmanuel FRC in Abbotsford BC, and in 2009 and 2016 this work was performed in the Canadian Reformed Church in Langley. The choir performed the oratorio Creation (Johan Bredewout) in 2014 and 2015. In the spring of 2014 Frank worked with a project Male Choir. In the Reformation year 2017 the choir performed the Reformation Cantata by Jorrit Woudt.